(Newser) – Seniors who want to gauge their own longevity might want to take a simple sniff test. 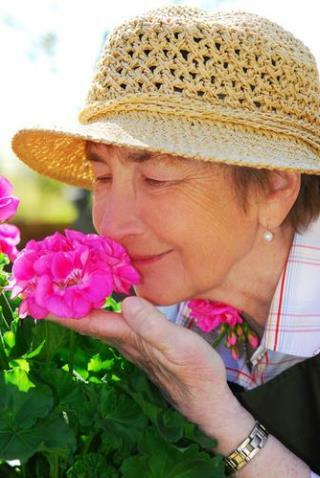 Researchers at the University of Chicago found that older people with a lousy sense of smell were significantly more likely to be dead in five years than those who could easily detect common scents, reports the BBC. In their study, the scientists asked about 3,000 Americans ages 57 to 85 to identify five such scents: peppermint, fish, orange, rose, and leather. Researchers checked back in five years and discovered that 39% of people who got none or only one correct had died, reports LiveScience. In contrast, only 10% of those who got four or five right had died. As it turns out, a bad sense of smell was a bigger predictor of death than cancer, heart disease, or lung disease, reports WebMD. There could be some serious credence to this. My grandmother was an expert cook, as were most of the women of the WWII generation. She was from the era that if you ate out, it was some very special occasion. By the time I came along, it was like a normal American experience to eat out. I remember that she started to complain that she had lost her sense of smell so she feared her cooking suffered. It really didn't but she did lose the benefit of enjoying her own cooking. So it was just a month after she last complained that a NAFTA truck lost its brakes and ran her car over and killed her. "something smells fishy" about the study! Maybe nobody "nose" the answer to longevity! I have never had a good sense of smell. I must be among the undead. Longevity is the prime human obsession, representing little other than our fear of death. I will take pleasurable distraction over longevity in a heartbeat. My children have been spared the insoluble dilemma: I never created any.